Nine Jersey Shore Boca players from the Class of 2005 have finalized their decisions to continue their soccer and academic careers in college this fall and one has narrowed his choices to three schools. Seven are multi-year veterans of the Super Y-League and three will be on the roster of the Boca U20 team this summer. 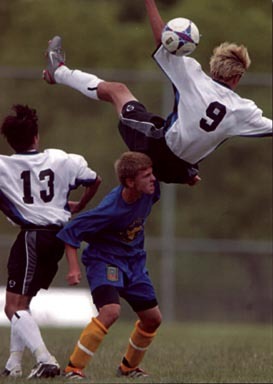 TOMS RIVER, NJ (April 9, 2005) – Nine Jersey Shore Boca players have finalized their decisions to continue their soccer and academic careers in college this fall and one has narrowed his choices to three schools as announced today by the Club. Andrew Finger upends a Chesapeake Athletic player in Super Y-League action. He will be one of ten Boca players from the Class of 2005 continuing his soccer and academic career in college in the fall. The nine high school seniors who have made college decisions include Sean Babcock of Barrington (Haddon Heights HS) who will attend West Chester University (PA); James Daly of Bayville (Central Regional HS) who will attend Methodist College (NC); Chip Fidler of Williamstown (Williamstown HS) who will attend Norwich University (VT); Andrew Finger of South Harrison (Kingsway Regional HS) who will attend Neumann College (PA); Ryan Morris of Brick (Brick Memorial HS) who will attend East Stroudsburg University (PA); Chris Nelan of Barrington (Haddon Heights HS) who will attend the College of New Jersey (NJ); Mark Petruniak of Hightstown (Hightstown HS) who will attend American University (DC); Mark Schmeigel of Toms River (Toms River North HS) who will attend Bucknell University (PA) and Jake Weinberg of Highland Park (Highland Park HS) who will attend Rutgers University (NJ). In addition, Daniel Brackley of Hamilton (Peddie School) has narrowed his choices to Carnegie Mellon University (PA), New York University (NY) and Boston University (MA). “On behalf of all of our Coaches and Directors within our Club, I would like to congratulate these ten players who will continue to play the game they love at the next level. All of them have made great decisions on their choice of colleges and our Club is very proud of them and wishes them the best of success” said Walt Konopka, a member of the Jersey Shore Boca Board of Directors. Babcock, Daly, Fidler, Finger, Morris, Nelan and Weinberg are multi-year veterans of Boca’s Super Y-League teams under the direction of Coach Wolf Finger and all will be on the roster of the Club’s U-19 Super Y-League team for 2005. Petruniak and Schmeigel, who have signed National Letters of Intent for their respective colleges, along with Brackley, are new members of the Jersey Shore Boca U-20 men’s team, coached by Konopka. They will participate with the U-20s in the Mid-Atlantic Summer Showcase League (MSSL) this summer. During the 2004 NCAA intercollegiate soccer season, Jersey Shore Boca had forty-three Club standouts that previously played for Boca on either their Men’s, Super Y-League, Premiere Development League, Club or Youth teams who were members of their respective colleges soccer teams.